All photos by Dalia Hatuqa. Hear/read her accompanying story, Visual storytelling emerges as a medium to de-code Holy Land conflict. 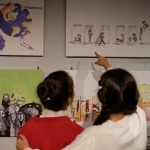 The first Palestine Comics Festival was held in East Jerusalem with the aim of encouraging young new talent and reviving cultural life in the Holy Land. 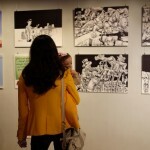 Comics and graphic novels by Palestinian and international cartoonists were showcased depicting the reality of Israel-Palestine tensions. 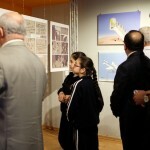 Girls from an East Jerusalem school were invited to attend the exhibition. The organizers hoped this would pique their interest, especially because comic strips are a relatively novel genre in the region. 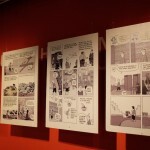 At East Jerusalem’s Yabous Cultural Centre, 50 standalone cartoons, comic strips and excerpts from graphic novels were on display- all with political messaging. 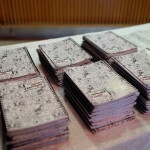 People from all walks of life attended the event, which drew international and local graphic novelists. 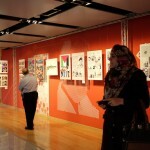 The organizers say the festival’s goal is to encourage cartooning among Palestinians and to showcase a new breed of talents. 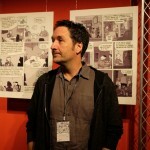 In attendance was Guy Delisle, a Canadian cartoonist, who won an international award for his travelogue ‘Jerusalem: Chronicles from the Holy City.’ He said his inspiration came from living in the Holy City in 2009. The event proved controversial when one of the leading artists, who was due to present his work, was deported by Israeli immigration authorities at Tel Aviv’s Ben Gurion Airport. Palestinian political cartoonist Mohammad Sabaaneh was jailed in Israel for five months for his satirical work. 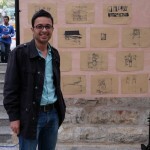 He works for al-Hayat al-Jadida daily in Ramallah.